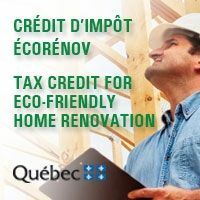 Make the most of the new temporary tax credit of the Government of Quebec by including your ventilation work to your list! 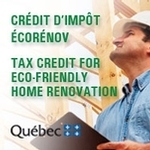 A temporary refundable tax credit for eco-friendly home renovation has been introduced. To qualify for the tax credit, the work must have a positive environmental impact or improve the dwelling's energy efficiency and meet recognized environmental and energy standards. The amount of the tax credit corresponds to 20% of the portion of an individual's eligible expenses that exceeds $2,500, up to a maximum tax credit of $10,000 per eligible dwelling. Ventilation System - Installation of an ENERGY STAR qualified heat recovery ventilator or energy-recovery ventilator certified by the Home Ventilating Institute (HVI) and listed in Section 3 of their product directory (Certified Home Ventilating Products Directory). In addition, where installation makes it possible to replace an older ventilator, the new appliance must be more efficient than the older one. Think about it now to receive your tax credit for spring 2014!